The blinking lights of servers and whirring of equipment inside a data center help to virtually power businesses, but how does that impact customer experience? Customer experience is at the heart of business success. It is easy for enterprises to overlook the way every small detail of how a business operates can ultimately impact a customer relationship. Some generations look at their devices more than 150 times a day. Whether your end user is buying coffee from you via an app, or you’re collecting industrial usage information, the rapid prevalence of data and artificial intelligence is transitioning most types of companies into data companies. To serve growing markets with excellent service means prioritizing IT strategies. 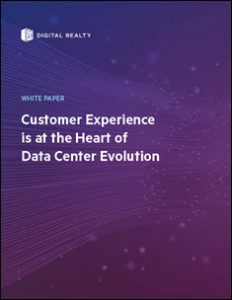 This white paper from Digital Realty explores how growing markets are impacting data center strategies, and ultimately how the customer is the heart of the data center evolution.